For a long time, traditional Western medicine focused rather on symptoms not on the causes of the symptoms, using man-made chemicals as a basis for treatment. As this approach is changing, the landscape of integrated medicine is changing, and we are still faced with many chemical based drugs that represent potential serious adverse effects, especially if used long term. In contrast, traditional Eastern medicine and modern natural medicine use natural herbs and plants together with other natural ingredients, as well as a holistic approach to concentrate on the causes of the health problems. Natural medicine of today is also evolving by employing serious science and pharmaceutical safety and research techniques together with clinical studies to develop and validate natural medicines and to provide the most effective and safe treatment alternatives. Like a gourmet dish, it's not just the ingredients that make it nutritious and delicious. It's the quality of the ingredients, the ratio of ingredients, the preparation, and the training of the chef that matter. It's the same with herbal formulas, and Herborium is the industry expert in selecting quality herbs, getting the ratios just right, and consistently producing a safe, highly effective acne treatment product. AcnEase® is the only all botanical ingredients based systemic product that prevents new acne from coming. It works for adult and teen acne, for females and males and is a safe alternative to Accutane and its generic versions. It may be used by individuals with different complexions (from very light to dark) and does not have sun exposure restrictions. AcnEase is also very successful in alleviating symptoms of rosacea, including redness. None of the herbal ingredients in AcnEase are listed by the US FDA and EMEA in EU as dangerous, forbidden or a questionable herb or plant. None of the ingredients are considered endangered species. Gardenia Fruit (Fructus Gardeniae) is a herbal drug derived from the dried ripe fruit of Gardenia Jasminoldes Ellis. According to traditional chinese medicine, Gardenia acts on the heart, lung and Three Jiao Meridians whose major effect is to alleviate blood heat, induce diuresis, and remove toxins. In western herbaceutical science, Gardenia is known for its cleansing and anti-inflammatory properties. Gardenia Fruit is an important ingredient present in AcnEase to reduce inflammation and eliminate toxins. Houttuynia (Herba Houttuyniae) is a Chinese drug made from the dried herb Houttuynia cordata Thumb (Fam. Saururaceae). It relieves toxins and promotes the drainage of pus. Hottuyniae's primary usefulness is attributed to its ability to address infections. Scierotium (Poriae Cocos) is a medicinal mushroom that assists digestion and serves as a catalyst for improved metabolism. This ingredient works synergistically with the ingredients in AcnEase, thereby further reducing acne symptoms. Dandelion (Herba Taraxaei) is a Chinese drug made from the dried herb Taraxacum Mongolicum Hand, Taraxacum Sinicum Kitag or several plants of the same genus. Dandelion, often known to the general public as a pesky weed, has been know for centuries in natural medicine for its many benefits. It helps the stomach and liver functions, and has an effect on reducing swelling and sores. Dandelion is credited with an anti-inflammatory action and decreasing the size of abscesses. Balsam Pear is really not a pear, nor does it smell like a balsam. It is however a true natural apothecary loaded with beneficial qualities. It has even been cited in 2008 in the Journal of Food Biochemistry for its potential for diabetes treatment. Balsam Pear is a gourd like vegetable with an unpleasant smell of an un-fresh fish. In addition to being rich in potassium, Vitamin A, C and many antioxidants, Balsam Pear helps with the management of sugar and carbohydrates, which is so important for good skin health. Together with the Mustard Leaf, it also has a cleansing and even analgesic effect. Mustard Leaf is a brassica, much like broccoli and cabbage. The entire vegetable is edible, not just the veined green leaves. The vegetable is native to southeast Asia and has a history of cultivation that dates back thousands of years. Mustard is rich in many vitamins and nutrients that are beneficial to everyone. It's rich in Vitamin A, calcium, zinc and iron and helps to restore bacterial balance in the intestines. Mustard has been used throughout the world to relieve pain, and as a diuretic and an antibiotic. AcnEase is 100% free of any animal products, by-products or derevatives. 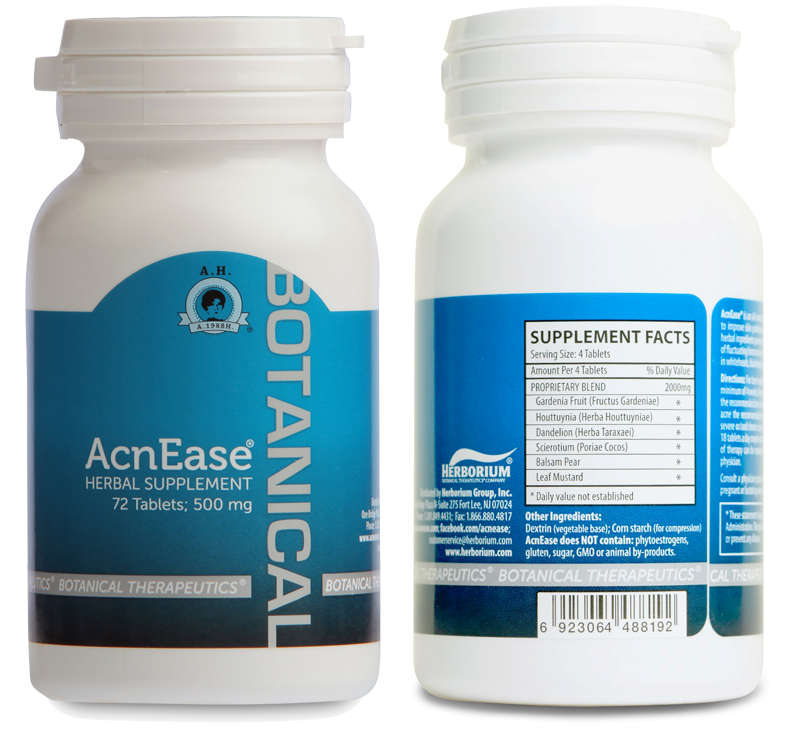 AcnEase is a 100% plant based product including the thin tablet coating that is also a vegetable extract. AcnEase does NOT include any of the following: gluten, sugar, dairy, GMO’s, phytoestrogens - so it's of course vegetarian and vegan diet friendly. All herbs used in the AcnEase® formulation are of the highest quality and tested for the presence of heavy metals, residual pesticides and bioburden. The identity and quality of the starting herbs are qualified by a top pharmacognacist. AcnEase has been extensively tested and proven safe in clinical trials. The ingredients present in AcnEase have been tested extensively at doses that greatly exceed the human dose and have been shown to be safe with no signs of toxicity. In addition, none of the herbal ingredients present in the AcnEase formula have been cited on the list of dangerous herbs compiled by the FDA, or MCA (UK) nor on lists of herbs known to cause side effects. The herbs used to make AcnEase are not present on the endangered species list. The ingredients present in AcnEase have been tested extensively at doses that greatly exceed the human dose and have been shown to be safe safe with no signs of toxicity. In addition, none of the herbal ingredients present in the AcnEase formula have been cited on the list of dangerous herbs compiled by the FDA, or MCA (UK) or on lists of herbs known to cause side effects. The herbs used to make AcnEase are not present on the endangered species list. The same herbal ingredients do not always result in the same product or the same properties and benefits of the product. As in the production of wine, the same grapes may lead to a product that justifies a price of $5.99 or $159.00 per one litter bottle. Efficacy, and safety of herbal supplements too depend on selection of ingredients and manufacturing process. For example - in the composition of AcnEase, if the ratio of the ingredients is incorrect, the acne may actually get worse. The source and quality of the ingredients is also important. Similar to the well-known fact that the same type of grapes grown in France, California and Australia have different properties and provide for a different wine, also herbs grown in different parts of the world and under different conditions may have different properties. Finally, a part of the plant that is actually used in the process and the extraction process itself are also very important. Whether the plant is extracted with water or organic solvents greatly changes what active ingredients you will have in your preparation. Obviously the ratio (proportion) of ingredients is crucial to the product efficacy and is a result of regimental and lengthy clinical studies and also protected by trade secret.